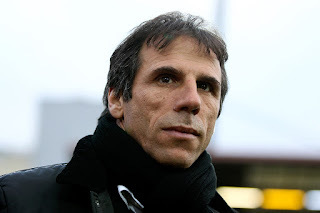 Chelsea legend Gianfranco Zola believes Antonio Conte is still the best man to lead Chelsea amid speculation of Chelsea wanting a new coach. There have been talk of Conte leaving when the season is over and Chelsea bringing in a new coach. The former Juventus coach does not have a good relationship with Chelsea board. He once expresses his frustration at the club way of going about their transfer business. Tho Antonio Conte still has a year left on his contract with the club, many believe he will be sacked at the end of the season. "It is easy to say Antonio Conte is not happy. He is a winner and has always been like that since he was a player. He wants things to go his way and right now they are not, so he can't hide his disappointment." "I genuinely think he is a good fit for Chelsea, one of the best coaches around, and as I want the best for Chelsea so hope his stays. There are a few issues, but hopefully, they solve them." Just yesterday Chelsea qualify for the semi-final of the FA Cup and the will be playing against Southampton. Conte will like to finish the season with a trophy and the FA Cup is the last trophy Chelsea can fight for this season as they are out of the Champions League and Manchester City are favorite to win the Premier League.